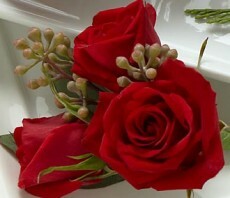 Red Spray Rose Boutonniere has a fresh and modern look that will set the tone for your wedding day. Featuring two red spray rose blooms accented with seeded eucalyptus, this boutonniere is the perfect choice to celebrate your day of love and commitment. 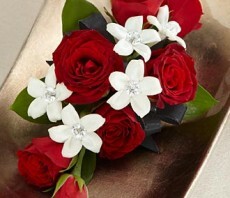 Approximately 4"H x 3"W.
Poetry Corsage is the perfect way to complement the wonderful women in your life on your wedding day. Brilliant red spray roses are gorgeously accented with white stephanotis blooms donning sparkling pins at the center to create an eye-catching display of floral beauty and elegance. 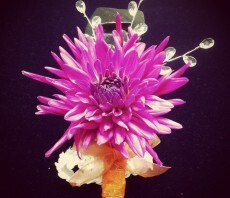 Approximately 4"H x 3"W.
Enchantment Boutonniere is the perfect complement to the overall look of your wedding party. 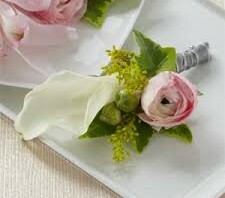 A single white mini calla lily and a pink ranunculus bloom are accented with variegated ivy and solidago tied together with a silver gray ribbon to create a wonderful complement to the style of your groomsmen. 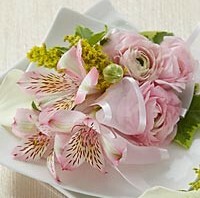 Approximately 4"H x 2"W.
Enchantment Corsage is a blushing representation of gorgeous grace and beauty. Pink ranunculus, pink Peruvian lilies, and white mini calla lilies are accented with lush greens and a pink sheer ribbon to enchant them at every turn. Approximately 5"h x 4"W.
Sweet Sunshine Wristlet is a ray of warm sunshine to honor any of the special women in your life on your wedding day. 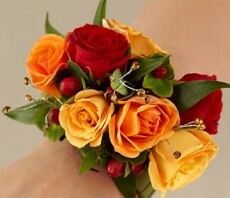 Red, orange and yellow spray roses are accented with red hypericum berries, lush greens, and topaz rhinestone pics are perfectly arranged on a wristlet covered with a sage grosgrain ribbon for an incredible look. 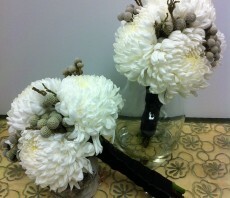 Approximately 5"H x 3"W.
Simple, elegant white and silver bouquet of football mums and silver brunia wrapped in black satin. 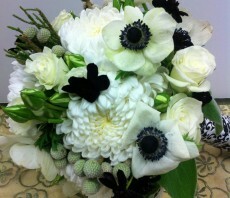 Upscale black and white bouquet of anemones, football mums, silver brunia, spray roses and lamb's ear wrapped in damask ribbon. Simply elegant. 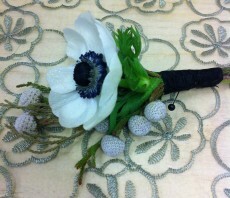 Beautiful black and white anemone bound with silver brunia makes an elegant spring corsage.